Making San Francisco-style parklets work in Toronto requires more than just California dreamin’. Photo by the San Francisco Planning Department. What would you do with a space 5.6 meters long by 2.6 meters wide in downtown Toronto? As cramped quarters and creative roommate configurations become the norm in an increasingly unaffordable housing market, urban dwellers look to public spaces for a spot to snack, socialize and simply pause. With personal space at a premium, the area occupied by a parking space (just over 14 square meters) is ripe for civic experiments and unexpected interactions. Parklets are a response to high density city living that gives pedestrians control over spaces typically reserved for cars. The idea emerged in San Francisco and involves the conversion of a street parking space (or two) into a long narrow park that extends from the sidewalk into the street but is sheltered by planters, umbrellas and seating. Parklets have gained traction in cities around the world both as grassroots interventions led by community groups and as economic development tools endorsed by local businesses and supported by municipal governments. The City of San Francisco has run a Pavement to Parks program since 2009 and is now home to more than 50 parklets. Although urban enthusiasts and professional planners in Toronto are aware of the potentially transformative effect of parklets, the realities of winter, rush hour parking restrictions, and even the legacy of amalgamation, complicate changes to a few square meters of pavement. As a result, parklets have a short history in the city, with one example appearing on Church Street in 2013 and another on Elm Street in 2015 [PDF]. 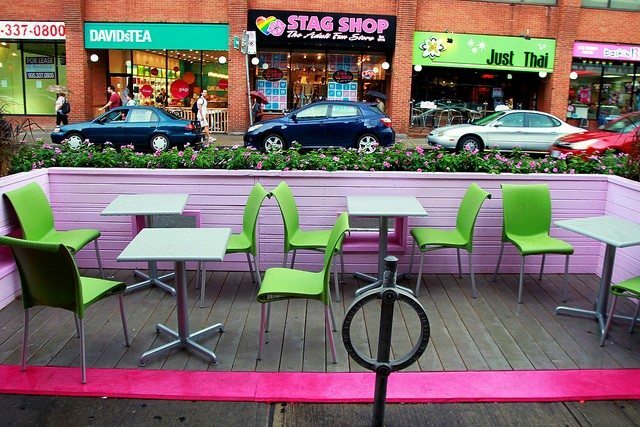 The City of Toronto provides design guidelines (PDF) for parklets but the current approach is being refined as part of a larger review of regulations surrounding outdoor cafes. In this context, “outdoor cafe” refers to more than sipping a cappuccino on a patio and encompasses a range of commercial and community uses on and around sidewalks. Chris Ronson, a project manager for pedestrian projects with the City of Toronto, explains that the review takes a broad perspective on parklets in order to provide flexible solutions that “work for patrons but also work for pedestrians and neighbourhoods.” This means improving design guidelines not just for public spaces that extend into parking spots but also considering the advantages of new uses directly in front of buildings or in the buffer between the sidewalk and the street. The consultation process has also identified the need to incorporate diverse materials into parklets and other similar projects. In Ronson’s works, “you’d no longer have to put a fence up” around a patio or seating area. Instead, the review proposes a range of techniques, from tables to planters, to define clear edges and contribute to a navigable streetscape. 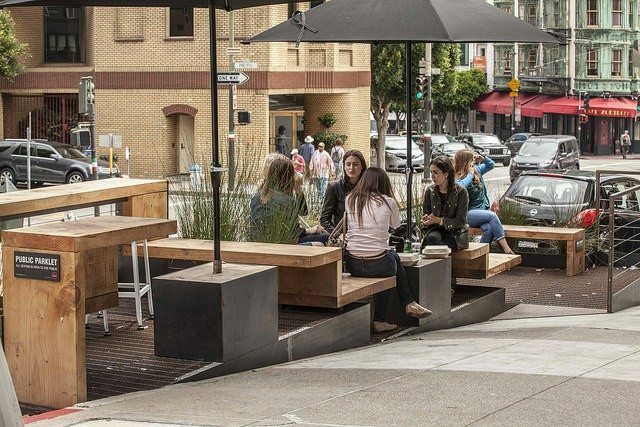 Regardless of what materials are used or who sits where, parklets in Toronto face challenges that are not an issue in San Francisco. For one thing, parklets must be removed seasonally to make way for snow plows. Another issue, as Ronson reiterates, is that a parklet “must occupy a permanent parking space.” This is not as straightforward as it sounds because, as you’ll know if you’ve ever looked for parking during peak hours, much of Toronto’s street parking vanishes during rush hour to create an extra traffic lane. 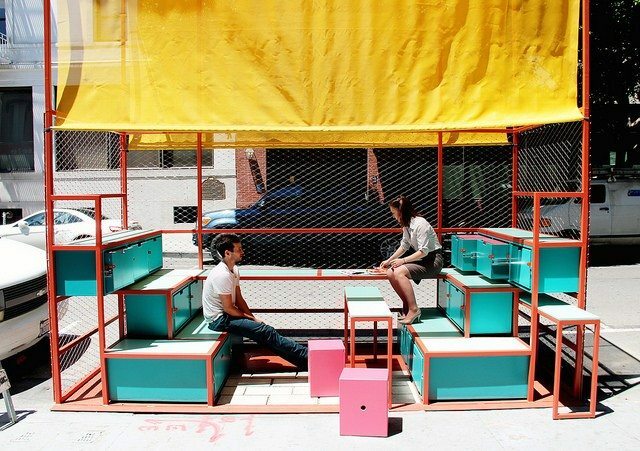 In the long term, enabling the creation of parklets that respond to conditions unique to Toronto will contribute to a more viable and inviting public realm than uncritically imitating an approach that has worked elsewhere. Just as urban planning rarely offers one size fits all solutions, the dimensions, rates and regulations of street parking vary from city to city, so it’s worth the wait for a public process and for parklet design resources made in Toronto, for Toronto.